Simple syntax, powerful tools. 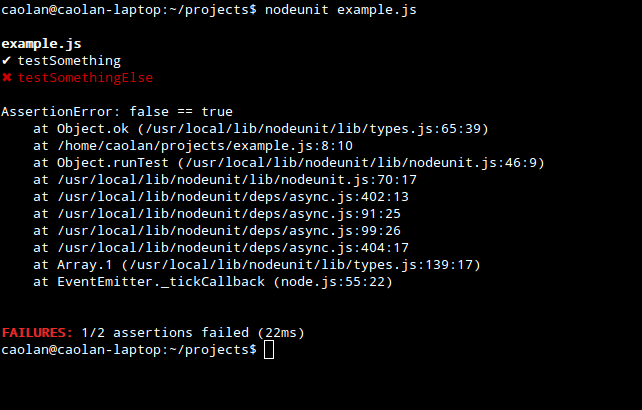 Nodeunit provides easy async unit testing for node.js and the browser. The project is very stale. We've kept it working on new versions of node, and sometimes merged small PRs that help teams relying on nodeunit. Nodeunit was the arguably first testing framework developed for node. It was very useful at the time, but there's an overwhelming number of other worthwhile testing solutions out there that are actively maintained. tap, ava, tape, mocha, jasmine, jest, ... the list goes on and on. If Nodeunit were truly bringing some different philosophy to the testing scene I'd say yes effort should be made to shore up it's development, but given how many other great options there are out there, a benefit of letting it atrophy is it's one less choice people have to make when choosing a testing solution. You are strongly encouraged to check out other more modern testing options. and thanks to cjohansen for input and advice on implementing setUp and tearDown functions. See cjohansen's fork. Also, check out gerad's nodeunit-dsl project, which implements a 'pretty dsl on top of nodeunit'. More contributor information can be found in the CONTRIBUTORS.md file. ok(value, [message]) - Tests if value is a true value. equal(actual, expected, [message]) - Tests shallow, coercive equality with the equal comparison operator ( == ). notEqual(actual, expected, [message]) - Tests shallow, coercive non-equality with the not equal comparison operator ( != ). deepEqual(actual, expected, [message]) - Tests for deep equality. notDeepEqual(actual, expected, [message]) - Tests for any deep inequality. throws(block, [error], [message]) - Expects block to throw an error. doesNotThrow(block, [error], [message]) - Expects block not to throw an error. ifError(value) - Tests if value is not a false value, throws if it is a true value. Useful when testing the first argument, error in callbacks. expect(amount) - Specify how many assertions are expected to run within a test. Very useful for ensuring that all your callbacks and assertions are run. done() - Finish the current test function, and move on to the next. ALL tests should call this! Nodeunit aims to be simple and easy to learn. This is achieved through using existing structures (such as node.js modules) to maximum effect, and reducing the API where possible, to make it easier to digest. Tests are simply exported from a module, but they are still run in the order they are defined. Note: Users of old nodeunit versions may remember using ok, equals and same in the style of qunit, instead of the assert functions above. These functions still exist for backwards compatibility, and are simply aliases to their assert module counterparts. When testing asynchronous code, there are a number of sharp edges to watch out for. Thankfully, nodeunit is designed to help you avoid as many of these pitfalls as possible. For the most part, testing asynchronous code in nodeunit just works. You cannot do this when running tests in parallel. In order to keep testing as simple as possible, nodeunit avoids it. Thankfully, most unit-test suites run fast anyway. When testing async code it's important that tests end at the correct point, not just after a given number of assertions. Otherwise your tests can run short, ending before all assertions have completed. It's important to detect too many assertions as well as too few. Combining explicit ending of tests with an expected number of assertions helps to avoid false test passes, so be sure to use the test.expect() method at the start of your test functions, and test.done() when finished. In this way, it's possible to have multiple groups of tests in a module, each group with its own setUp and tearDown functions. If no entry file specified, test defaults. When using the included test runner, it will exit using the failed number of assertions as the exit code. This means it exits with 0 when all tests pass. --reporter FILE - you can set the test reporter to a custom module or on of the modules in nodeunit/lib/reporters, when omitted, the default test runner is used. --list-reporters - list available built-in reporters. --config FILE - load config options from a JSON file, allows the customisation of color schemes for the default test reporter etc. See bin/nodeunit.json for current available options. -t testName - run specific test only. -f fullTestName - run specific test only. fullTestName is built so: "outerGroup - .. - innerGroup - testName". If you wish to use a commonjs format for your test suites (using exports), it is up to you to define the commonjs tools for the browser. There are a number of alternatives and it's important it fits with your existing code, which is why nodeunit does not currently provide this out of the box. In the example above, the tests will run when the page is loaded. The browser-version of nodeunit.js is created in dist/browser when you do, make browser. You'll need UglifyJS installed in order for it to automatically create nodeunit.min.js. If you don't want people to have to install the nodeunit command-line tool, you'll want to create a script that runs the tests for your project with the correct require paths set up. 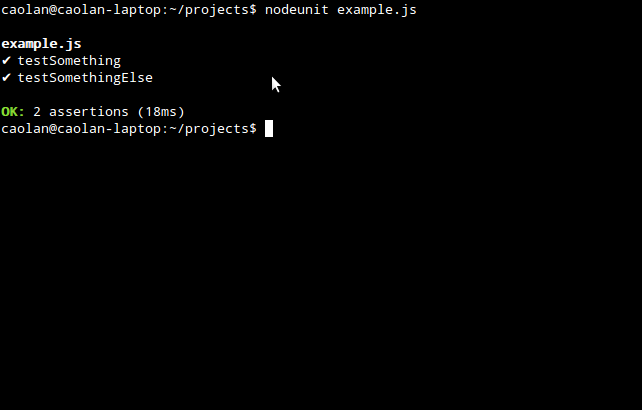 Here's an example test script, that assumes you have nodeunit in a suitably located node_modules directory. Now if someone attempts to run your test suite without nodeunit installed they will be prompted to download the submodules for your project. machineout - Simple reporter for machine analysis. There is nodeunit.vim which is useful for TDD on VIM. passed() - did the assertion pass? failed() - did the assertion fail? For a reference implementation of a test reporter, see lib/reporters/default.js in the nodeunit project directory. Note: When working with the sandbox if your script depends on outside sources (i.e. using require) then you will want to pass that into the optional context when setting up the sandbox. // Passing module.exports into the sandbox will give your code  access to it. // will share the cache with modules already required from outside the sandbox. The tests for nodeunit are written using nodeunit itself as the test framework. However, the module test-base.js first does some basic tests using the assert module to ensure that test functions are actually run, and a basic level of nodeunit functionality is available. Note: There was a bug in node v0.2.0 causing the tests to hang, upgrading to v0.2.1 fixes this. There is nodeunit.vim so you can use nodeunit with VIM. That compiler uses machineout reporter and it is useful to use with vim-makegreen. Contributions to the project are most welcome, so feel free to fork and improve. When submitting a pull request, please run make lint first to ensure we're following a consistent coding style.